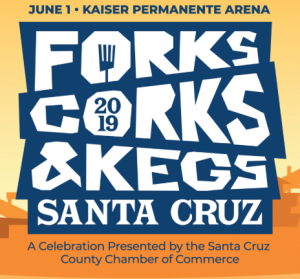 The first annual Forks, Corks, & Kegs Festival will serve host to many local wineries, breweries, spirits and restaurants to celebrate Santa Cruz County. Join us for a fabulous day of fine wine, craft beer, delicious food and live music! Spend the afternoon sampling the delicious flavors from dozens of the best local restaurants, wineries (including Bonny Doon Vineyard!) and breweries. This is a 21 and over event – no one under 21 will be permitted in the event.